There are few things as fascinating in interior decorating as watching rough materials such as wood, metal and concrete being used in creating graceful design elements. The transition from coarse to beautiful is the best metaphor for the imaginative power that can transform the most unlikely materials into gorgeous functional or decorative items. Here is Cumulus, the light fixture designed by Sam van Gurp, that gives the concept of light dimming a new twist. 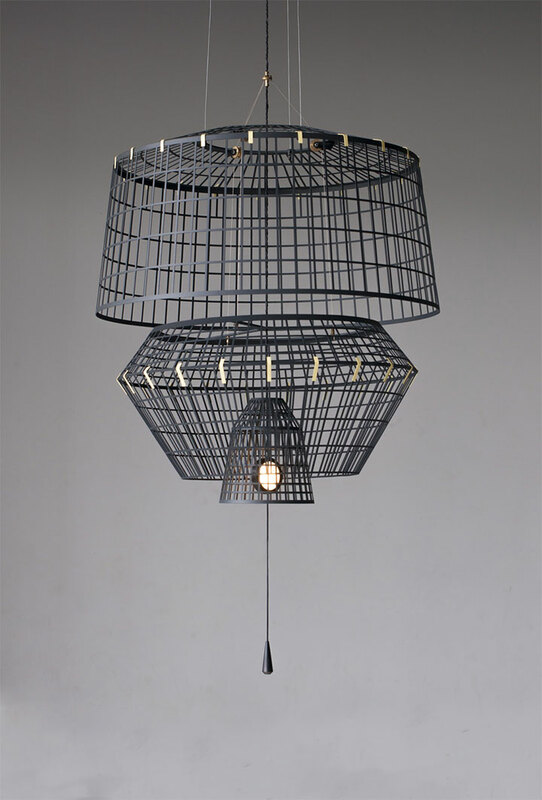 The lamp is made of three metal cage-shaped caps that cause the progressive dimming of light when sliding over each other. When it comes do designing light fixtures, concrete is a surprising yet effective material. The rough texture of the concrete offers a fitting contrast to the immaterial nature of light. 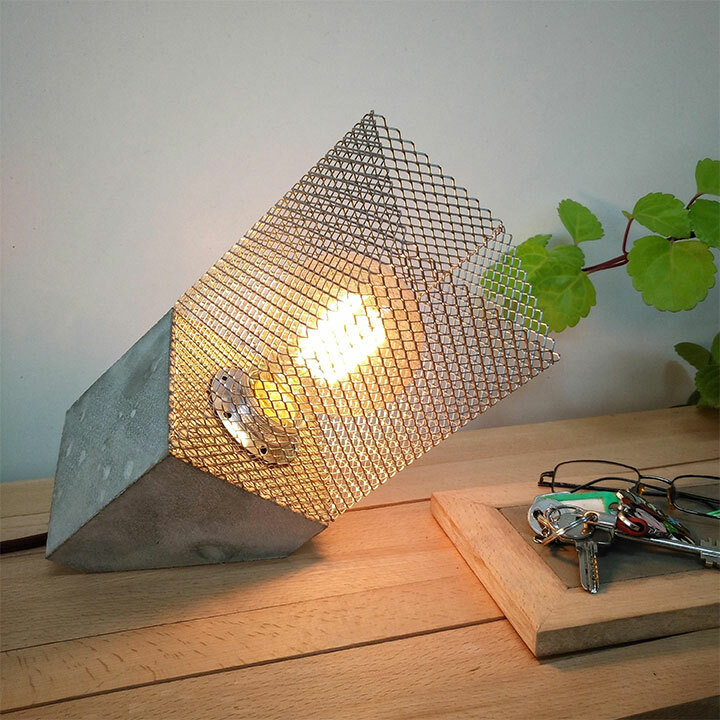 This concrete table lamp combines a modern tilted geometric shape with the industrial vibe of the steel mesh lampshade and concrete base. 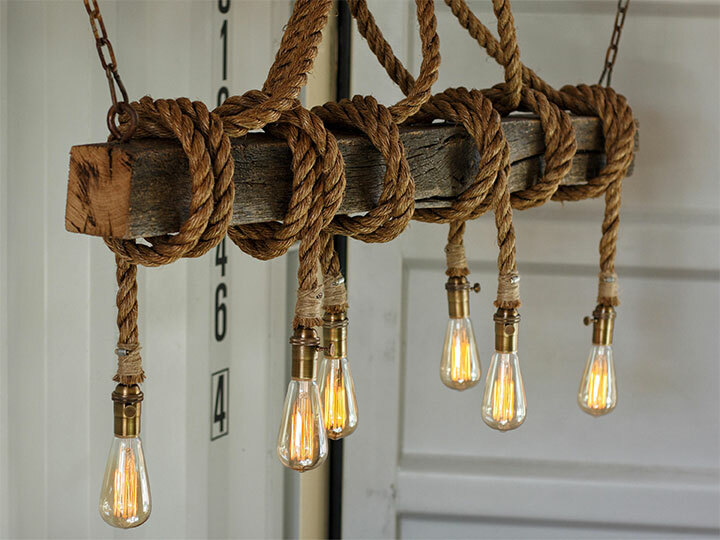 The use of concrete in light fixtures does not necessarily imply an industrial interior decor. 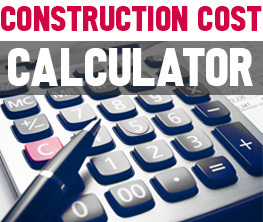 This coarse material can simply serve as a balance or contrast for other design elements, or the background against which other materials are allowed to shine. 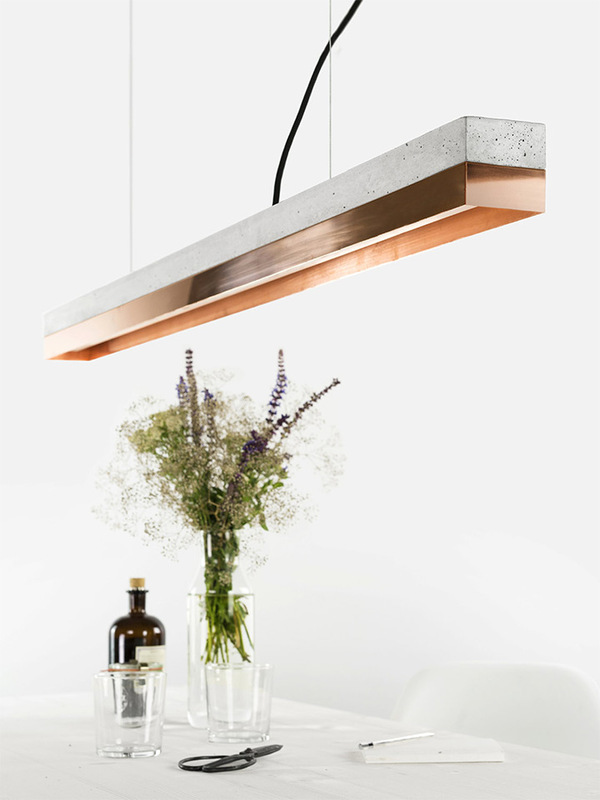 For instance, this long pendant, perfect for hanging above a long table or bar, pairs a slab of concrete with an elegantly polished chrome sheet. The result is a modern light fixture, with a tinge of minimalism. Rope is another unexpected element in interior design, often used in combination with metal or wood to achieve a rustic effect, as in the case of this handcrafted pendant. 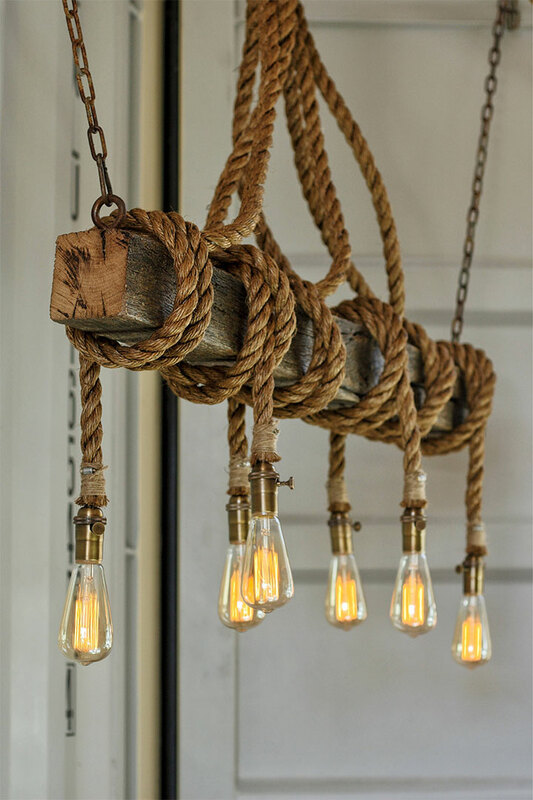 Wound around a wood beam, a series of manila ropes end with exposed light bulbs for a design that looks both spontaneous and calculated. 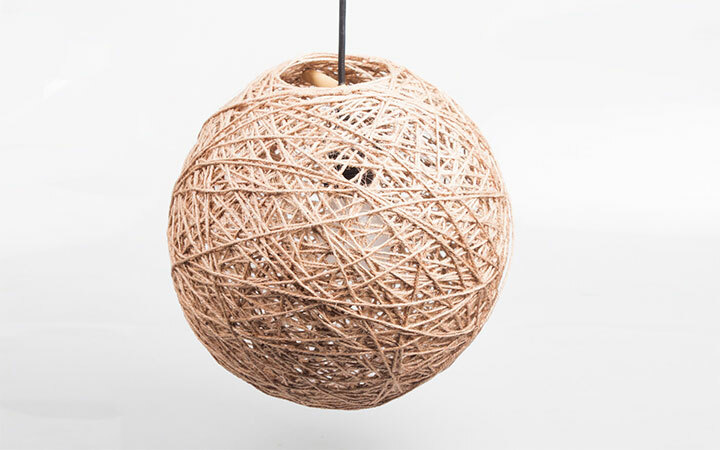 An apparently easy DIY project, where yarn is wrapped around a balloon to create a spherical lamp shade, a light fixture like the one below demands, however, a good technique and a careful hand. Ideal for a room that needs a personal touch, this pendant’s shade filters the light and helps create a cozy ambiance.